With a show record pages long, GV Bey Phantom was one of Huckleberry Bey’s most successful progeny. 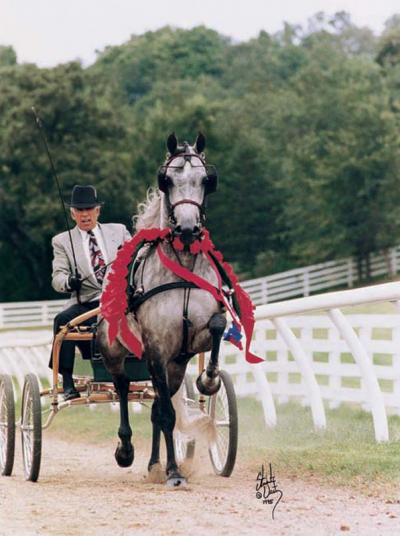 Out of the mare PHP Micha Rappora (by Rappor Tee), the 1989 grey gelding was successful in the show ring in multiple divisions, including English pleasure, driving, informal combination and side saddle. His titles are many, and include both the Canadian and U.S. National Championship honors in 1994 in Arabian English Pleasure Adult Amateur Owner to Ride 18 – 39. In his last outing, at the 2004 Youth Nationals, GV Bey Phantom was Champion Arabian Pleasure Driving JT 17 & Under and Top Ten in both the Arabian Ladies Side Saddle English JT 17 & Under and Arabian English Pleasure JO 14 – 17. GV Bey Phantom passed away in March, 2006.